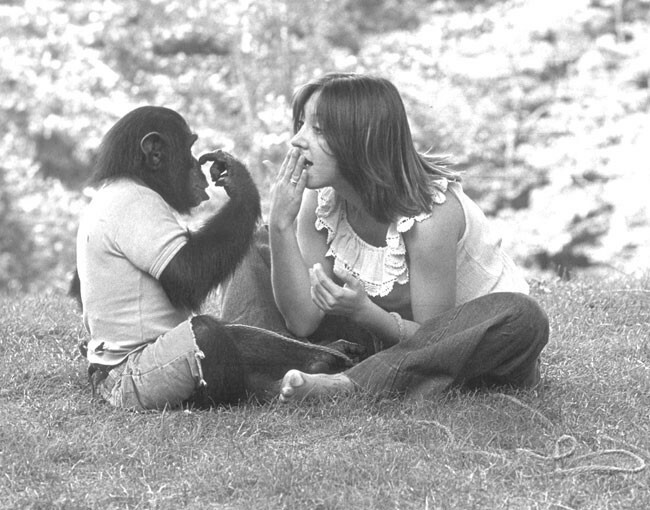 Project Nim, a documentary by director James Marsh (Man on Wire) about the true story of a chimp raised as a human by hippie pseudo-scientists in the 1970s, opens at the Enzian Theater this weekend. At the same time, Rise of the Planet of the Apes, the surprisingly elegant summer blockbuster about a chimp raised as a human by James Franco, is playing everywhere else. Although an endorsement to see both as a double feature sounds like a jokey tweet, it’s genuine: Having seen Nim before Apes actually enhanced my regard for both. It’s almost as if the makers of the Apes remake were at least aware of the titular Nim experiment, as Apes is as much a motion-capture spectacular as it is a cautionary tale. As well it should be, as the frustrating, illuminating, captivating Project Nim makes perfectly clear. Incorporating real footage, tastefully handled reenactments, TV broadcasts, newspaper clippings and present-day interviews, this is the story of Nim Chimpsky, the chimpanzee taken from his mother as a newborn and raised by Stephanie LaFarge, the impressionable student and lover of the monstrous Herbert Terrace, a Columbia psych prof hailed as a genius at the time. LaFarge’s mission was to treat Nim as if he were her human child; he ate at the dinner table, wore diapers, and later, jeans, and even toked up a little. It’s all a loving, if hippie-dippie, experiment to LaFarge, Terrace and his minions. That is, until Nim hits adolescence and, well, goes chimp on their asses, mauling one handler and attacking many others. Terrace shuts the project down and ships Nim to a medical lab to be held in a dingy cage. Of course, to anyone but the kind of person I don’t want to meet in a dark alley, that’s torture. To raise Nim as a person only to one day tell him he’s an animal and is to be poked and prodded in a steel prison is to lack any empathy. But, as presented by Marsh – though not in the overt way I found myself craving from the beginning – the biggest victim is science, something demonized by the “progressive” Columbia gang. Notes and charts, facts and figures were nothing but cold data to these people, and what they were doing was revolutionary, man. So all those years spent sacrificing Nim’s hope for any normal chimp life went to waste in service of some vague concept of inter-special communication. Project Nim’s ethical credibility is, counter-intuitively, its biggest weakness, as Marsh presents every increasingly depressing stage of Nim’s life with equal aplomb. He doesn’t condemn or condone from behind the camera or in the editing room, but matches the feeling in the air at those times. Toward the beginning of the experiment, everyone was quite pleased with themselves, and so, then, is the film. It’s like watching a happy family take a road trip when you know the car is going to crash; that doesn’t make the family any less happy until the moment of impact. And that’s fair enough, as frustrating as it may be. I will gladly keep my outrage to myself until Project Nim catches up to my reaction if it means preserving the film’s integrity. After all, I can let all that aggression out later at Rise of the Planet of the Apes.